I have a confession…I’m on a texture binge…and I couldn’t help but apply it to this beautiful picture of Leah. This little girl is too cute and I wish her mommy had a blog because she photographs so well. 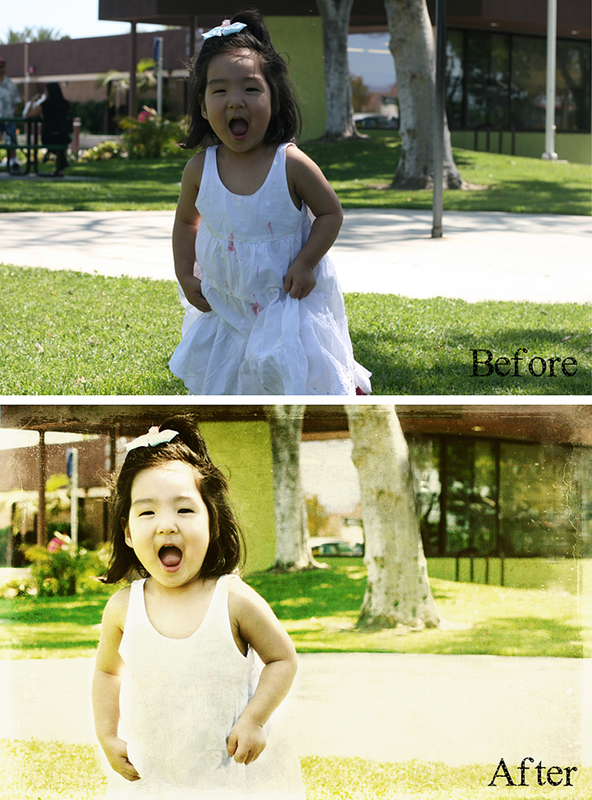 The before shot was sweet – beautiful little girl wearing a beautiful white dress…with some sort of red juice all over it. The expression on her face says that she just made a mess and doesn’t care – it’s as if she’s saying “LOOK AT ME!” I love it. On top of that, I was distracted by some of the background. For my “after”, I ran the photograph through my typical post-processing steps: Curves adjustment, Squeaky Clean and Baby Powder Room (although I only used the lighten face feature to remove some of the shadow from her face). I then used Coffeeshop’s Little Perk to give her a little color boost with a touch of sharpen. I think I noticed at this point the poles in the background and the red on her dress. When you’re removing anything like this, it takes a combination of cloning and healing to get it right. Her dress just needed some healing while I used both the cloning and healing tools on the poles in the background. By cropping and moving her to the left side, I also eliminated the other distraction on the left side. At this point, I started layering textures. I essentially used the same steps I used with this other Before & After for the textures piece and finished it by applying Nelly Nero’s Antique Overlay. What do you think? Oddly enough, I just went through a ton of editing from my weekend pictures and didn’t apply textures (minus my i heart faces submission yesterday) to any of my shots – I guess that’s the difference in editing 100+ pictures and one. If you want any of the actions used in this before and after, just click Inspiration and you’ll find links to all of the sites I’ve used. Also, if you have any new challenges or photos you’d like me to edit/blog, just Contact Me.